Most League Championships: 11 (1946, 1947, 1963, 1965, 1969, 1980, 1986, 1990, 1992, 2002, 2008). Tied with defunt Fresno Cardinals/Giants for League lead in number of championship titles. Most Wins (Half Season): The 1955 Ports won 55 of 75 games in the first half of the season. Most Consecutive Wins:The 1947 Ports won 26 consecutive games from June 4 to July 1. Longest Game (Time):The 2009 Ports played a 7 hour, 34 minute game on June against High Desert. 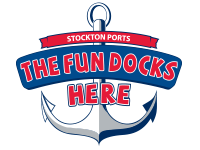 The Ports lost the game, 7-6 in 21 innings. The game was called at midnight due to California League rule and resumed and completed on June 5. Most AB (Game): The Ports had 76 total at-bats in a 7-6 loss (21 Inn) against High Desert on June 4, 2009. Most H (Game): The Ports totaled 29 hits against Rancho Cucamonga on August 1, 1993. 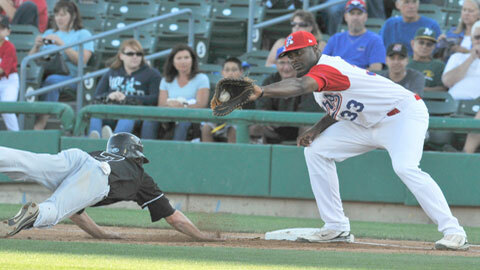 Most 2B(Game): The Ports totaled 11 doubles against Bakersfield on June 15, 2010. Most 3B (Game): The Ports totaled 6 triples against Ventura County on July 11, 1986. Most SO (Season): The Ports totaled 1,313 strikeouts in 1972. Fewest SO (Season): The Ports totaled 470 strikeouts in 1946. Most Sac Hits (Season):The Ports totaled 132 sacrifice hits in 1952. Most Sac Hits (Game): The Ports totaled 6 sacrifice hits against Modesto on July 9, 1950. Lowest ERA(Season): The Ports team ERA of 4.08 was lowest of all teams in 2014. Lowest Batting Average by a Leader for a Season: Philip Mastagni led the California League with a .308 batting average in 1967. Most Doubles in a Game: James Carver is tied with 4 doubles in a game, which he accomplished on August 19, 1959 against Fresno. Stephen Parker is tied with 4 doubles in a game, which he accomplised on June 15, 2010 against Bakersfield. Most RBI in a Game: 1954 Ports - Robert Rivich collected 11 RBI vs. Bakersfield on May 22, 1954. Most Sacrifice Flies in a Season: Mark Cridland had 16 sac flies in 1999. Most Sacrifice Flies in a Game: Jonas Hamlin had 3 vs. Riverside on June 3, 1995. Most Walks in Game: LaVel Freeman walked 6 times on May 22, 1984 vs. Salinas. Most times Hit by Pitcher in an Inning: Greg Schaub was hit twice in the fourth inning of the first game against Bakersfield on May 31, 1999. He was hit twice by Manny Bermudez. Fewest strikeouts in a season: Nino Bongiovanni only struck out 7 times in 116 games and 517 plate appearances for the 1946 Champion Ports. Lowest ERA in a season: William Wegman posted the lowest earned run average in league history with a 1.30 ERA in 1983. Most complete games in a season: Robert Thorpe threw 32 complete games in 1954 (30 of which were consecutive from May 6 to the close of the season, also a league record). Most wins in a season: Robert Thorpe won 28 games in 1954, tied with Earl Escalante of the 1949 Bakersfield Indians and Larry Jackson of the 1952 Fresno Cardinals. Most consecutive games won: Charles Beamon won 16 consecutive games from May 6 to July 4, 1955. His streak ended when he was recalled to the Oakland Oaks of the Pacific Coast League. Alvin Spearman also won 16 straight cgemes from April 30 to July 15, 1956. His streak ended with a 7-1 loss to the Modesto Reds on July 20, 1956. Most innings pitched in a season: Robert Thorpe worked 300.1 innings in 1954. Most innings pitched in a game: 17 by Matt Zidich in July 27, 1948 against San Jose. Highest winning percentage in a season: Charles Beamon (16-0) with a 1.000 winning percentage in 1955. Most strikeouts in two consecutive games: 38 by Ed Barnowski. He fanned 20 batters on May 9, 1964 against Santa Barbara and then 18 on May 14, 1964 versus Salinas. Most Walks in a Season: Steve Dalkowski walked 262 times in 1960. Most runs allowed in a season: 189 by Arhtur Williams in 1956. Most HR allowed in a game:6 by Paul Steward on July 19, 1999 against Lancaster. • Catcher Kenneth Thomas--32 errors in 1952. • Pitcher Bud Anderson--12 errors in 1978. • Catcher Mike Mathney--20 DP in 1992. • Pitcher Steve Sparks--10 DP in 1991. • Second baseman Ron Koenigsfeld had 12 assists on August 11, 1980. • Third baseman Harry Clements had 11 assists on July 27, 1948. • Bud Watkins in a 1-0 win vs. Modesto on June 13, 1953. Watkins pitched nine no-hit, no-run innings. First batter in the 10th singled for the only hit of the game. Stockton won in the bottom of the 10th inning. • Ed Barnowski in a 3-2 win vs. Salinas on June 4, 1964. Barnowski pitched nine innings of no-hit ball. He was removed for a pinch hitter with the score tied 1-1. Stockton won the game in 10 innings. Most At Bats in a Game: 76 vs. High Desert Mavericks on June 4, 2009. Most Hits in a Game: 29 vs. Rancho Cucamonga on August 1, 1993. Most Triples in a Game: 6 vs. Ventrua County on July 11, 1986. Most Strikeouts (by team batters) in a Season: 1313 by the 1972 Ports. •Terry Wilshusen in 1969 had 21 saves.